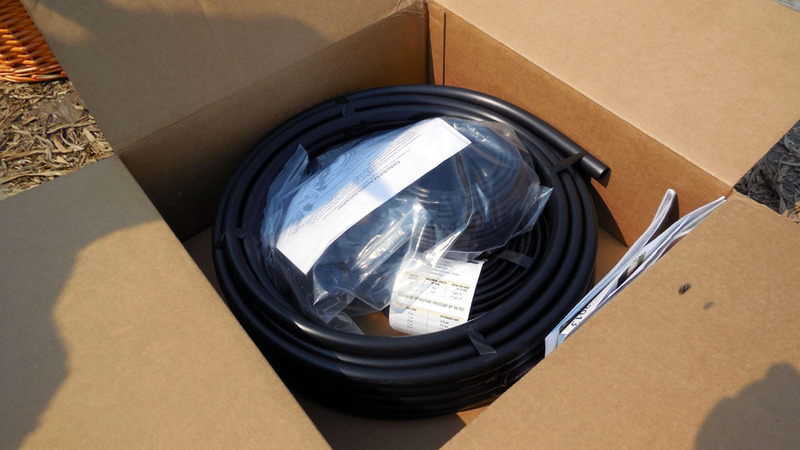 I received a free Drip Irrigation Starter Kit from Dripworks. All opinions are my own. As you all well know by now we have a large garden. 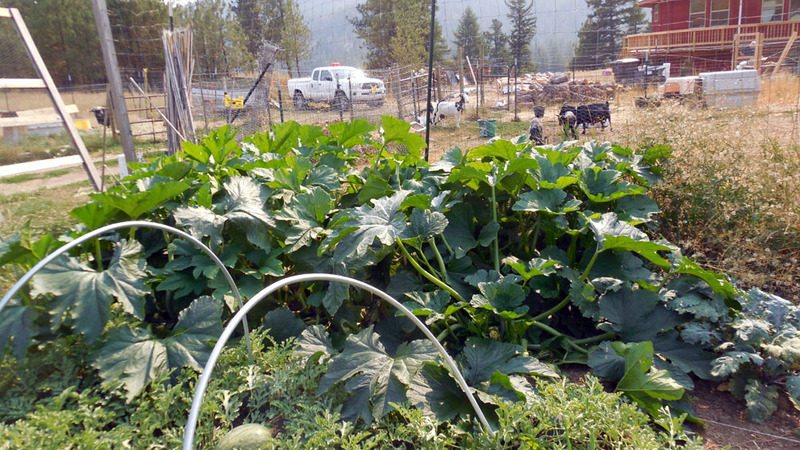 I must admit that said garden is hubby’s domain; he is the one who has done the research to figure out how to best get things to grow during our short season here in Montana. I am the processor – I get to can or freeze the proceeds from his garden. The ultimate goal is to be one year ahead on what we have stored so that if we have a disastrous growing season we will still be able to eat our own produce. I believe we will hit that goal this year. Not bad for our 5th year gardening. 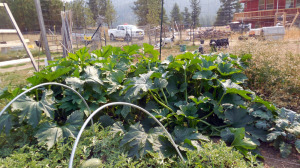 One of the best investments he made towards that goal was the purchase of a drip irrigation system. We live in a drought prone area and water is precious. The last thing he wanted to do was waste water in the garden by having to use a sprinkler type system. 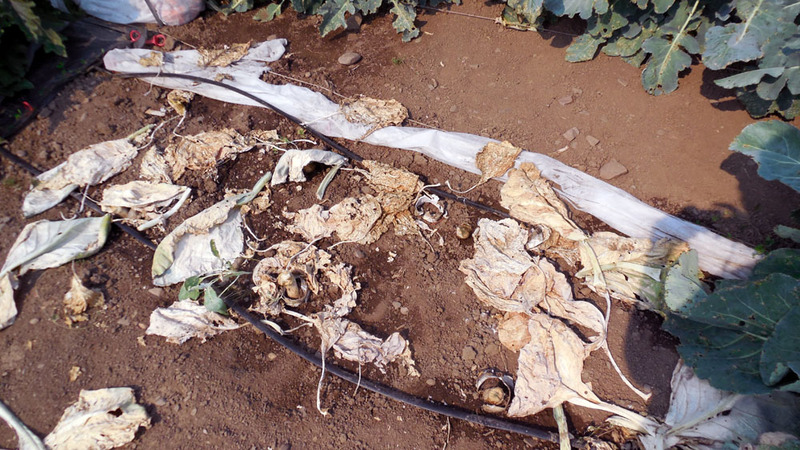 Today I’m going to show you the drip irrigation system’s effects in the big vegetable garden. On Friday I’ll show you just how easy the systems are to install – hubby will show you when he puts one in the berry garden. 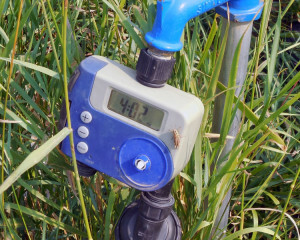 Grasshopper not included in purchase price! 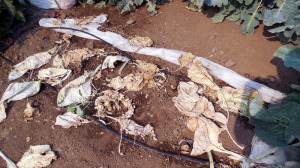 The drip irrigation kit in the big garden utilizes drip tape. 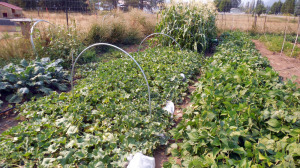 He sets the system up each year before he plants his seeds and seedlings. (You can also add the system after planting as you will see on Friday.) He purchased a timer which he set on the water hydrant and that was that – the garden gets watered on a schedule and it really lets us save water! He doesn’t have to worry about whether the garden is getting enough water or too much water – he knows it is getting just what it needs. 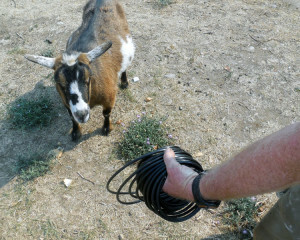 He runs two lines of the drip tape and lets everything grow around it. You can see what it looks like in the photo above from where the cabbages were harvested. The tape has small holes that lets the water drip out to water the plants just where they need it. It really does let us save time, money and water. This year we put in three new gardens; the berry garden, the herb garden and the asparagus garden. We hope, in time to have soaker dripline in all of them. The main difficulty right now is the hydrant. It needs some manner of whatsis to accommodate hose for the other two gardens. (I hope I’m not getting too technical.) So for this year we are only doing the berry garden. The kit from Dripworks arrived with everything the hubby needed to get the system set up and operating on my little berry plants. I will have a video showing just how simple it is to install. Of course there was an expert checking everything out before it even went into the garden. Pricilla LOVES strawberries and she wanted to make sure that her plants were well taken care of. She does not mess around when it comes to supervising. So be sure to come back Friday to see how the berry garden is doing and to see the installation of the DripWorks System.